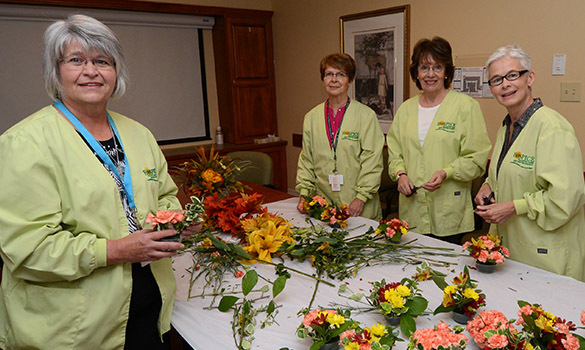 Every Thursday morning a small group of dedicated volunteers gather in the An Cala Board Room at the Cape Breton Regional Hospital to create lovely flower arrangements for all patients in the palliative care service. “The flower ladies” as they are affectionately known are a group of eight women, who alternate weeks working in two groups of four, started their work in a closet back in 1994. They continue their work today bringing joy and warmth to patients and families with a simple visit and flowers in hand. They are a creative lot, customizing the arrangements to mark special holidays and seasons of the year, delivering the bright floral arrangements with a smile. As with all things offered by the Society, community partners support this important outreach to patients.